The pancreas is a long, flat, pear-shaped organ located behind the stomach. It makes digestive enzymes and hormones, including insulin. 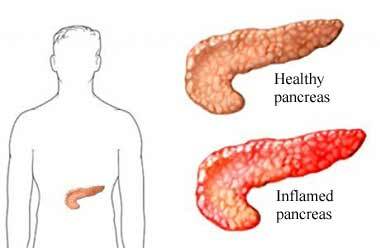 Chronic pancreatitis is a progressive inflammation of the pancreas marked by frequent acute attacks and risk of permanent organ damage. Chronic pancreatitis may result from injury, chronic infection, drug or toxic exposure, autoimmune disease, or blockage of the pancreas. In some cases it is genetic and sometimes has no known cause. Chronic pancreatitis is a risk factor for developing pancreatic cancer . You will be asked about your symptoms and medical history. A physical exam will be done. The diagnosis of chronic pancreatitis is difficult. Certain enzymes are much higher in the blood with chronic pancreatitis. The stool may have more fat. The goals of treatment for chronic pancreatitis are to relieve pain, and manage nutritional and metabolic problems. You will be advised to stop drinking alcohol. This may require counseling or a rehabilitation program. Stopping your alcohol intake is the most important intervention in your treatment. You may be advised to restrict the amount of fat in your diet. Pancreatic damage interferes with the body's ability to process fats. A registered dietitian can work with you and create a healthy meal plan. Necrosectomy—Removal of dying or dead (necrotic) pancreatic tissue. Pancreatic necrosis is more serious if an infection is present. This procedure can also be done with endoscopy. ERCP—To open any collapsed ducts or drain cysts. Cholecystectomy —To remove the gallbladder. To help reduce your chances of chronic pancreatitis, avoid or stop using tobacco and alcohol. Chronic pancreatitis. EBSCO DynaMed website. Available at: http://www.dynamed.com/topics/dmp~AN~T116518/Chronic-pancreatitis . Updated February 20, 2017. Accessed December 21, 2017. Chronic pancreatitis. Tulane University School of Medicine website. Available at: https://medicine.tulane.edu/find-doctor/surgical-care/liver-pancreas-center/liver-pancreas-conditions-symptoms/chronic. Accessed December 21, 2017. Pancreatitis. National Institute of Diabetes and Digestive and Kidney Diseases website. Available at: https://www.niddk.nih.gov/health-information/digestive-diseases/pancreatitis/all-content. Accessed December 21, 2017. Rasmussen HH, Irtun O, Olesen SS, Drewes AM, Holst M. Nutrition in chronic pancreatitis. World J Gastroenterol. 2013;19(42):7267-7275.